Falvey Memorial Library continues to recognize its dedicated student workers with the second installment of “Celebrating Library Student Workers.” This month we feature juniors Jessica Lu and Daniel Love, who assist the Circulation staff by helping patrons, checking books, videos and laptop computers in and out, and assigning study rooms. Also, Jessica reshelves books while Daniel works for Interlibrary Loan. Jessica Lu is a Harrisburg (Pa.) native majoring in communication with an English minor concentration in writing and rhetoric. She has worked at Falvey since September 2007. Jessica says she always enjoyed volunteering at her high school library, so working at Falvey was her first choice when searching for work study jobs. Jessica is president and founder of the Villanova chapter of the Girl Child Network. This organization is dedicated to promoting sexual assault awareness in the Villanova University community and raises money for its international organization, Girl Child Network Worldwide. 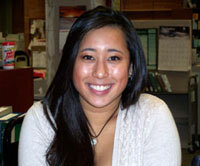 In addition, she works at the Admission Office and is a proud member of the Blue Key Society which gives campus tours. Daniel enjoys being able to help Falvey’s library patrons. His interlibrary loan duties include receiving books from other libraries, processing and sending books to other libraries and forwarding “pdf” articles to library patrons. He also works at the circulation desk on weekends. 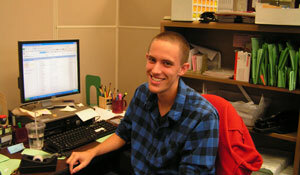 Daniel has participated in several Campus Ministry service trips. He traveled to the Navajo Reservation in New Mexico during fall break, 2009. He has also been on several service trips to West Virginia, Kentucky and South Carolina sponsored by Habitat for Humanity. Daniel is a leader for the Freshman Escape retreat, sponsored by Campus Ministry, which provides an opportunity for Villanova freshmen to meet and interact with other freshmen. For further information regarding employment at Falvey Memorial Library, contact Mary Heyman in the director’s office.